Teacher Smurf can be found holding a book in his left hand and points with his point with his right hand. On the first version the book was painted brown with the black letters ABCD on the pages and a yellow bookmark. This was later changed to a red book. 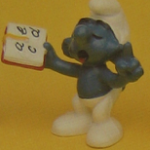 Both had the same markings – W.Germany Schleich S © 1980 Peyo markings. Schleich sold Teacher from 1980 to 1986/1991 – 1992/1996 – 1997/2000 – 2001. The Hong Kong version has always come with a red book with black letters ABCD on the pages and a yellow bookmark. Some collectors make a note of the thickness of the black letters and the yellow bookmark compared to the Schleich made ones. 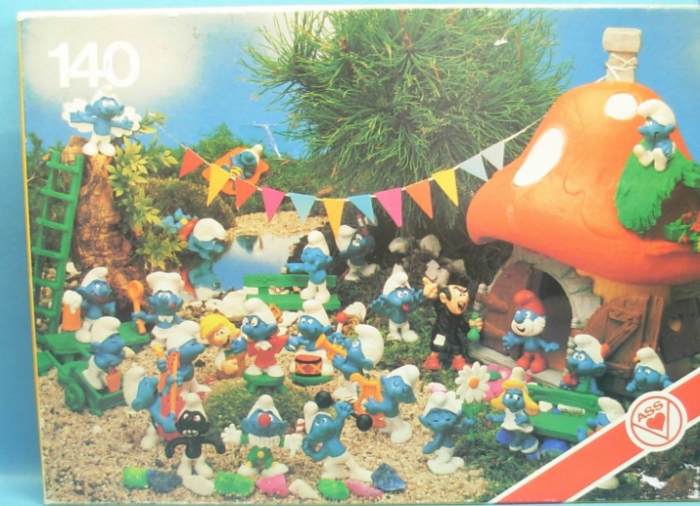 The Hong Kong one was produced with two different markings – Made in Hong Kong Schleich S © 1980 Peyo and Made in Hong Kong W. Berrie Co Schleich S © 1980 Peyo markings. Teacher was produced out of Hong Kong between 1981 to 1983. Not sure if you call this a variation or a paint error. There is one with no letters or bookmark in his book. 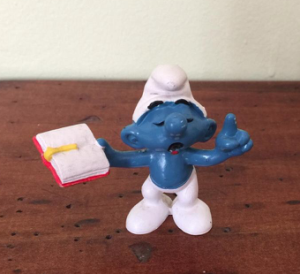 It has the markings W.Germany Schleich S © 1980 Peyo markings. In the 1980 Schleich catalogue which was used through to 1984 it shows Teacher with a brown book with black scribble on the pages. It is unclear if Schleich ever released this version. In the W. Berrie catalogues, you will notice in 1981 they display Teacher holding a book with red lettering (can’t see the colour of the book). In the 1982 catalogue they show Teacher holding a red book with black lettering. There are also a number of triangle pedestals that used the Teacher figurine. There are American, English, French, Nordic and promotional ones to be found. From personal experience when buying a triangle pedestal check out the older catalogues to ensure it is genuine first. There is nothing worse than buying a triangle pedestal in a foreign language to find it was not actually released like this.